In 1905, Mr. Frank Jarvis and Mr. Tommy Garner formed Conway Stewart & Co. Limited at 13 Paternoster Row London EC1, next to St Paul’s Cathedral in London. Today, this area is known as Paternoster Square having been redeveloped after its complete destruction during the Blitz of World War II. Although there is much debate regarding the origins of the Company's name, it is believed that the name “Conway Stewart" derives from a popular vaudeville act of the day. Conway and Stewart were supposedly a comedy double act who appeared at Collins Music Hall in Islington. The two entrepreneurs, took a great risk in leaving their secured jobs to start a new enterprise reselling fountain pens made by other manufacturers. They concentrated their energies and invested in importing pens from the United States. After an arduous month of persistent selling of their stock, they reaped the rewards of a rather healthy turnover of more than £13 and 9 shillings. This was a great accomplishment considering that the rent for their business premises was only five shillings a week. Even though this turnover would be pleasing to many new ventures, the strength of De La Rue in the fountain pen market made it impossible for the company to continue selling no-named fountain pens. In the same year, De La Rue reportedly invested £50,000 in a promotion campaign for their new launch, the Onoto. However, Garner and Jarvis soon recognized there was an audience desiring good, reliable writing instruments that were also affordable. This is when Conway Stewart began to capture a market amongst the English. Jarvis and Garner developed a single aim, to produce elegant and beautiful, yet functional writing instruments - a principle that Conway Stewart holds true to this day. 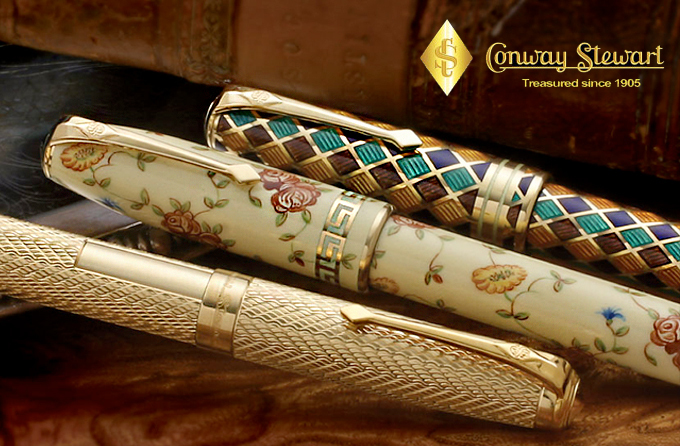 Many heads of state around the world and current celebrities also enjoy our Conway Stewart pens including Rick Wakeman, rock star and pen enthusiast, who has a large collection of Conway Stewart pens of which he is justifiably proud.